Food! Also known as one of my favourite things in life. There’s nothing better than arriving in a country and discovering all the new foods, spices and smells. The food in Morocco isn’t spicy at all but every meal is perfectly seasoned with some main spices: cumin, cinnamon, nutmeg and a Moroccan ‘all spice’. Everything that we’ve sampled has been amazing, there isn’t anything we’ve tried that we haven’t liked..and that’s rare. Nick has been (of course) the more adventurous foodie…he’s been eating lamb, veal and escargot from side of the road stands. I have also been crazy and have been trying different ice creams (pistachio and date are rather good!) I’ve also been sampling all of the pastry/cake carts on the road as well…just doing my part to try new things. 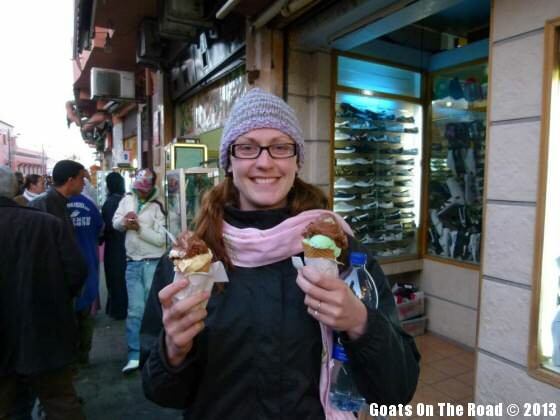 Sampling some exotic flavours of ice cream in Morocco. The meals here are massive and luckily for our budget, we are able to share lunch and dinner. Our favourite meals have been tajines, it’s like a stew served in a clay pot with your choice of lamb, beef, vegetarian or chicken with potatoes, carrots, peas, olives and a perfectly seasoned sauce. 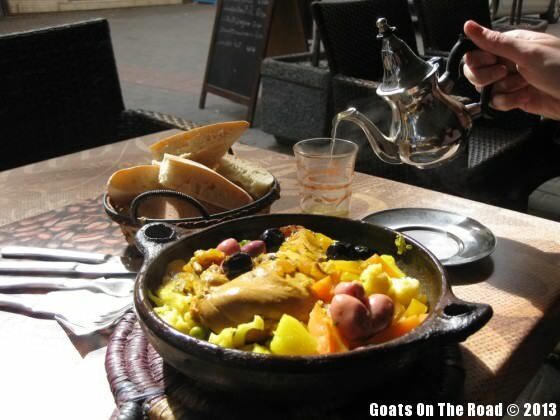 Our favourite meal in Morocco, the tajine! Another favourite is the couscous meals. A huge mound of couscous is served with your choice of meat and lots of vegetables and a side of juice/sauce to pour all over to make it nice and moist. Every meal is served with lots of bread and olives, no matter what you order. Along the Atlantic coast in the City of Essouira, we’ve had freshly caught fish grilled up in front of us, served with a salad and fries. Want more Moroccan food? 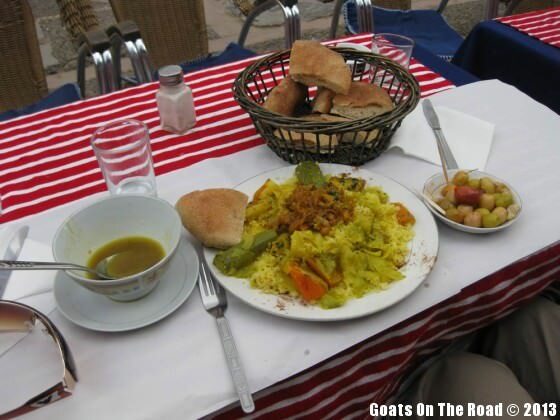 Check out this post: What to Eat in Marrakech. A massive, delicious chicken couscous meal with bread, olives and a chicken stock to pour overtop. Chefchaouen, Morocco. Yum! 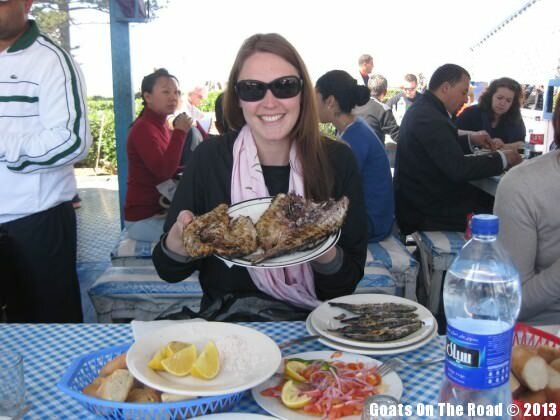 Freshly caught and grilled fish in Essouira, Morocco. For lunch, we’ve been having schwarmas (either a hollowed out round loaf of bread or a tortilla shell stuffed with meat, onions, cucumbers, tomatoes, carrots and a garlic yogurt sauce), kebabs (meats and vegetables on skewers with a side of fries) or a side of the road snack of some sort (chick pea soup, popcorn, snails, chicken and egg samosas, doughnuts, etc.). There are lots of “quick eats” joints around the towns and eating pastries as a snack or a meal isn’t uncommon. I think the most random thing we’ve had for lunch was from a Moroccan version of Subway. It was packed with local people so we thought we’d try it out. It was a baguette cut in half long ways and stuffed with your choice of meat and then we chose which toppings we wanted from these options: mashed potatoes, plain pasta, ham, pickles, red onion, cooked carrots, lettuce, French fries, mayo, hot sauce, tuna and olives!! Very bizarre, but very good actually. The most bizarre meal ever. 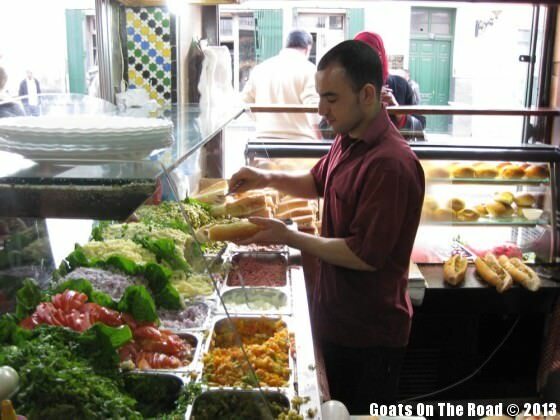 Morocco’s version of Subway. 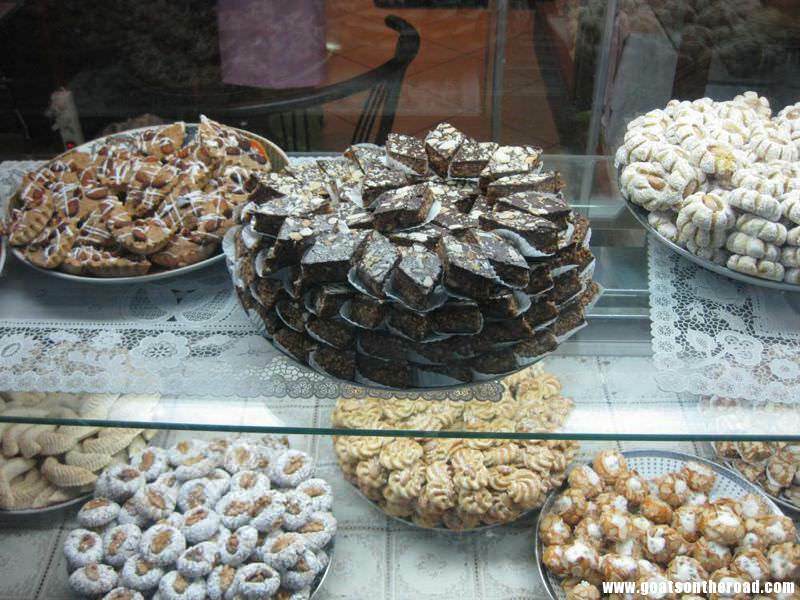 As well as having delicious food, Morocco is known for its sweets. There are cake/crepe/pastry shops everywhere! They sell cookies and cakes by the kilo in the stores and people are always out on the streets selling the delicious sweets as well. There are ice cream stalls everywhere serving some of the normal flavours like chocolate and strawberry and some more exotic ones like pistachio, fig & date, all of which are delicious. 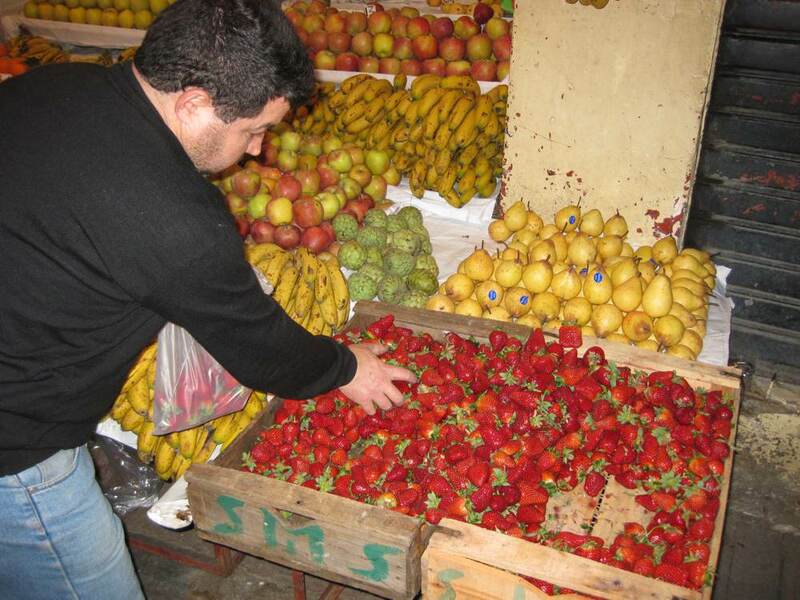 Besides the cakes and cookies, they sell fresh fruits on the streets for a very good price. We bought a kilogram worth of fresh, bright red, massive strawberries for $1.25! They were honestly the best strawberries we’ve ever had. Delicious sweets for sale, Tangier, Morocco . Delicious, bright red strawberries for sale on the side of the street. Tangier, Morocco. And then there’s the drinks. Fresh orange juice squeezed right in front of your eyes, mint tea with real stalks of mint leaves and loads of sugar, cafe au lait with amazing Arabic coffee, the best way to start the day! The Moroccan men can be found at any and all times of the day sitting in a tea & coffee shop smoking and having espresso. We were wondering why they weren’t out working and soon found out that many Moroccans work in Europe (particularly Holland) and send home Euros to their families here…which allows them to have more time for socializing and sitting around basically! However, we rarely see women sitting around in coffee shops; they are definitely predominantly male places. 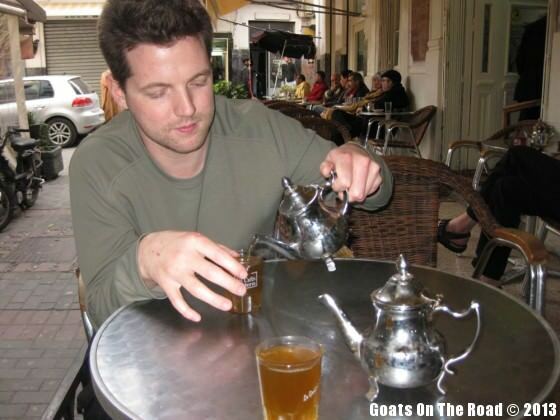 Having a tea break in Tangier, Morocco. 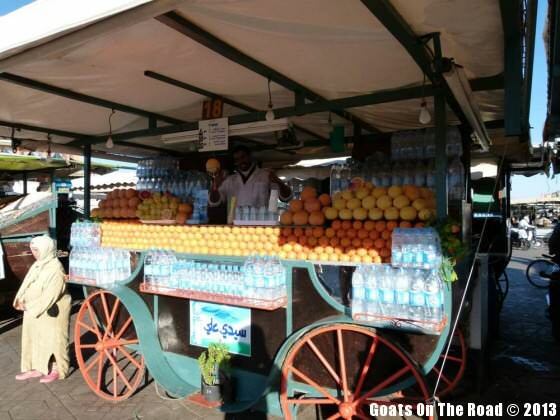 A fruit stall serving up amazing freshly squeezed juices. Marrakesh, Morocco. We have really enjoyed the Moroccan food and have been pleasantly surprised by the fact that everything we have tried we’ve liked. We have eaten Moroccan food for 3 meals a day…except that one day when I had a pizza :). Food is such a big part of our day: Where should we eat? What should we have? Can we afford to have a midday snack? etc. 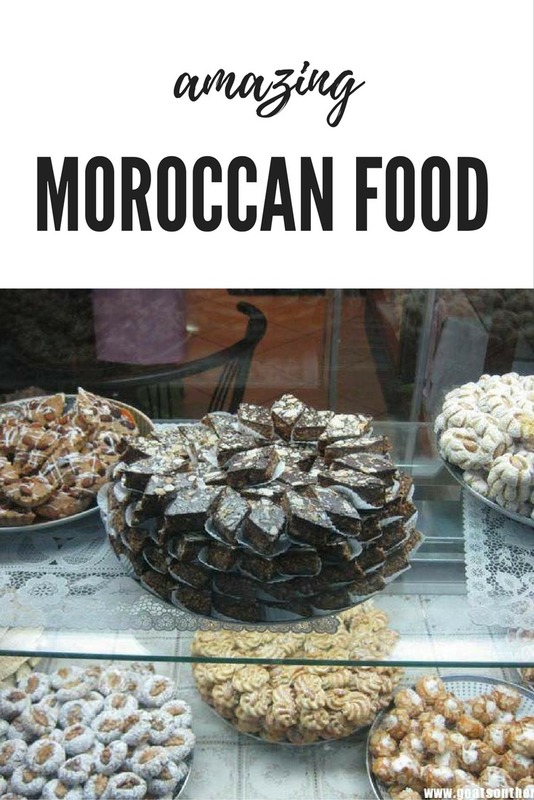 and thankfully Morocco has made the answers to all those questions easy for us…everywhere is good to eat, anything we choose we will enjoy, and the food is reasonably priced so we can even have dessert!